Crafted by hand using metal purposely aged to give it an industrial look. 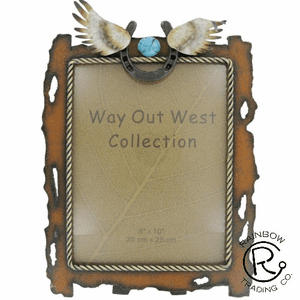 A classic country style of barbed wire and Horseshoe make this Frame a little like the Wild West. The metal angel wings and bright turquoise stone top it all off. This is a great frame to display your favorite memories. The frame hold an 8 by 10 photo displayed in a vertical fashion.